A common question I receive from homeowners who want to list their home this time of year is, 'Do homes sell in Indianapolis in the winter'? My answer is yes, they do. Are there fewer home sales in the winter? Yes, there are. Still, people do buy homes in every season. I have fallen into many snowbank (with my clients right behind me) and have even fallen on my backside getting out of car on icy driveways. All in a day's work, showing buyers homes during an Indianapolis winter. There are two distinct advantages to market your home in the winter. 2. Buyers are generally more serious. What is the difference in the number of sales in the winter compared to the rest of the year? I ran the numbers for the past year. These are the dates the homes actually closed. While winter sales are less, there are still quite a number of homes sold. The percentages equal 5989 homes sold in the winter months, 7726 homes sold in the summer months and 9313 homes sold in the Spring months. 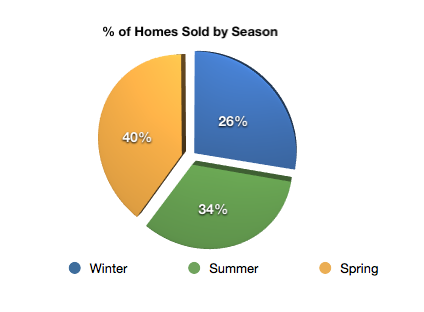 The number of homes sold in winter represents about 65% of the number of homes sold in the Spring. If you have questions about selling your home, please contact us @ 317-731-2319. Great post! People buy homes year round, but if someone is trucking their family through the snow to look at homes, they are serious buyers. The buyer's market this time of year makes it all the more important to listen to your Realtor with regard to staging, updating, de-cluttering, and cleaning. Good luck! Its great to see Winter sales quantified. I've sold more than a few homes each year in the Winter simply because competitor listings were removed from the market leaving a low inventory for active buyers to pick from.